AFF Suzuki Cup 2016 title sponsor Suzuki Philippines (SPH) got avid football fans into the groove with fun games and activities last November 19, 22, and 25,to mark the ASEAN region’s most prestigious football competition. To kick off the tournament, over 1,000 motorcycle club members and 500 Suzuki car club enthusiasts joined the parade to the Philippine Stadium in Bocaue, Bulacan, on the AFF Suzuki Cup’s first day. They were joined by friends and families who were equally thrilled to witness the matches and participate in the Cup’s activities. Braving the traffic to greet the Philippine Azkalsand cheer them on at the group stage games were 1,300 students, mostly hailing from the country’s top universities – Ateneo De Manila University, De La Salle University, University of Sto. Tomas, University of the Philippines, University of the East, and Far Eastern University. On the last day of the group stage games, November 25, 40 children from the JCI Manila – GK Smokey Mountain Football Club had the privilege of sitting on the best seats as they witnessed the Philippine Azkals battle for national glory for the very first time. Through this experience, SPH hopes to inspire them to likewise find their passion and eventually the courage to pursue it. Aside from the competition, there were activities and games in store for tournament attendees, too. Welcoming the spectators and guests at the Suzuki Village located just within the stadium’s premises were a huge arc balloon and a life-size soccer ball. The soccer ball allowed tournament-goers to leave their messages at the Philippines’ first-ever co-hosted AFF Suzuki Cup. Displayedat the Suzuki Village as well were SPH’s exciting lineup of automobiles and motorcycles. On display were the AFF-specially-dressed Suzuki Swift 1.2, the all-time favorite Suzuki Jimny, the multi-awarded Suzuki Ciaz, the well-loved Suzuki Ertiga, and the ever-stylish Suzuki Celerio. Smash 115 Fashion Colors, Address 115 Fi, and the Underbone King – Raider R150 were also among the motorcycles that have each captured tournament goers’ attention. While those on display provided attendees the perfect venue for taking photos, SPH prepared a number of games and activities – from the prize wheel down to the mini football games – to keep Filipino football fans’ energy levels up beyond the actual competition. 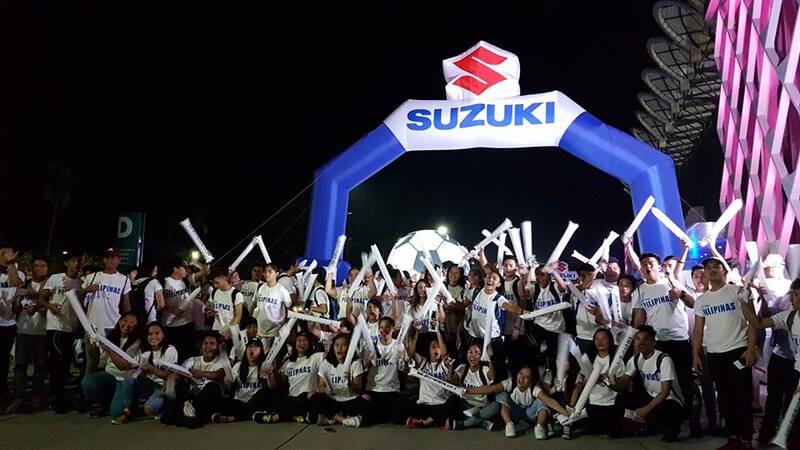 “Suzuki Philippines is honored to be part of this year’s AFF Suzuki Cup, which marks the country’s official debut as its co-host. With the help of our partners, we were able to bring the Suzuki Cup to full throttle and imbue a strong love for football among Filipinos, the latter serving as a great source of motivation to our Philippine Azkals,” Suzuki Philippines General Manager for Automobile Mr. Shuzo Hoshikura says. « The Lexus LC – Coming in like a Lion. A very good looking Lion.